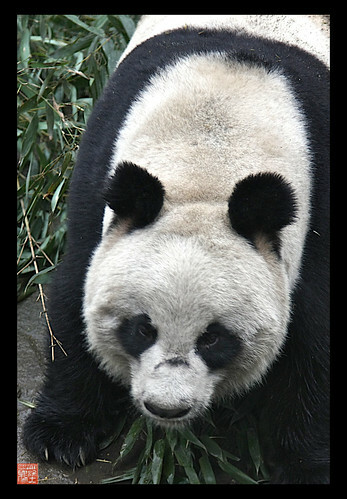 I chose Bai Xue for her unmistakable black “beauty mark” on her muzzle and her history of being a wild child, as she was the panda who disappeared from the panda center she was at for 5 years, then miraculously returned!! Just one look at her Bifengxia clay dipped bum and you know this girl marches to the beat of a different drummer. 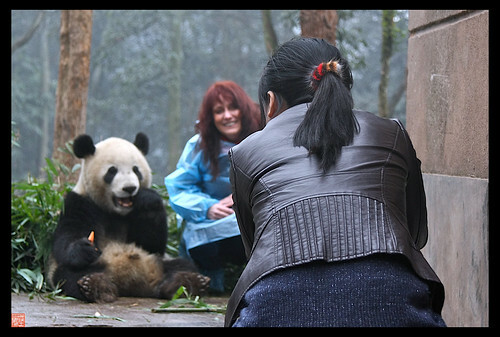 How endearing can one panda get….and to top it off she is a wonderful mommy at the age of 20 years it is estimated. I have so much to tell you about all the pandas, moonbears and elephants we met along the way, but this update is for our beautiful Bai Xue, who is asking for your help in completing this group adoption, as we still need 250.00 of the 500.00 required by Pandas International to finalize the sponsorship of our girl. I decided to extend the deadline until April 1, 2010, and you may easily pay 25.00 or more for your adoption pledge via Paypal or a check or money order. Regardless of how you choose to pay, each of the contributors will be receiving a downloadable panda artwork I designed just for our group with a value of 45.00. You may print this artwork as cards or a make a framed print for your own use, as a thank you from me for your generosity and caring. This very special panda art design will not be sold anywhere at any time, so it will be a collector’s item. I will reveal the design as soon as our adoption is finalized. Thank you all so very much for your support of the group adoptions at PANDARAZZI. 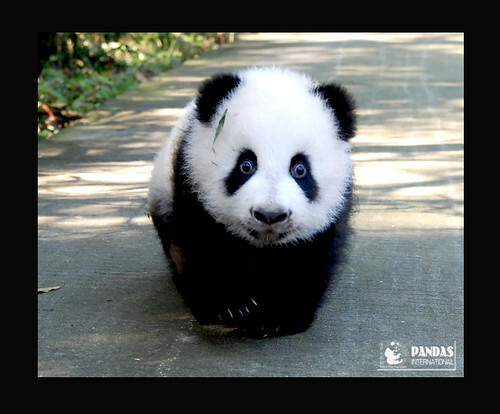 My dream is to continue to be able to provide a way to help others be a part of these unique adoptions of the China pandas by making them affordable for all who wish to participate. 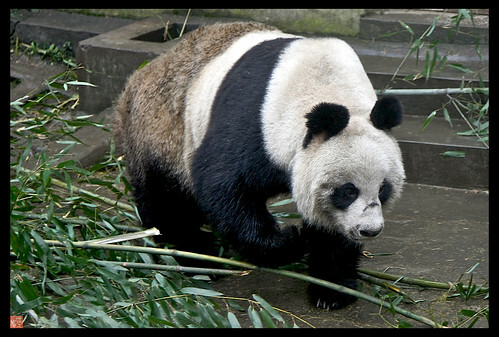 A $500.00 adoption can be out of reach for many caring panda people who would love to be involved. Being part of the “adoption den” you really see your donation dollars in action!! 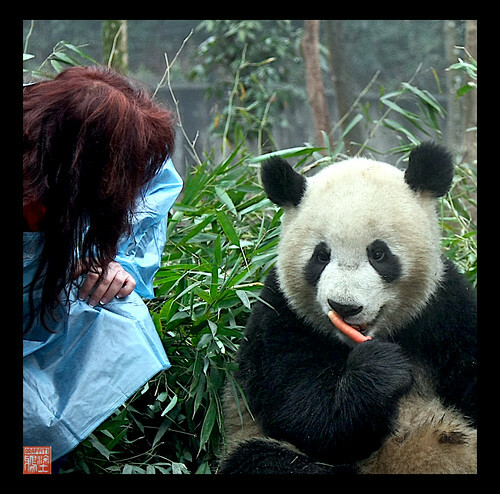 By providing a platform at PANDARAZZI where we all can shake down our piggy banks and pool our resources as a team, we all benefit from one another’s involvement, in turn, help each panda we sponsor with plentiful bamboo, medications, round the clock TLC by the nannies and keepers. Not to mention the AWESOME updates and photos which Carrie and the Bifengxia photographers provide us during the course of the year!! 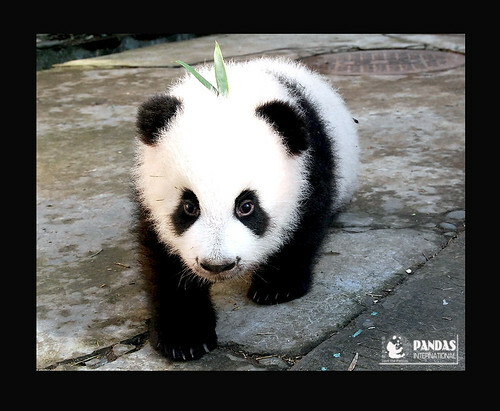 BAI XUE SENDS HER PANDA LUV AND THANKS YOU ..XIE XIE !!!!! !